Yes, Lavender Nights are back! 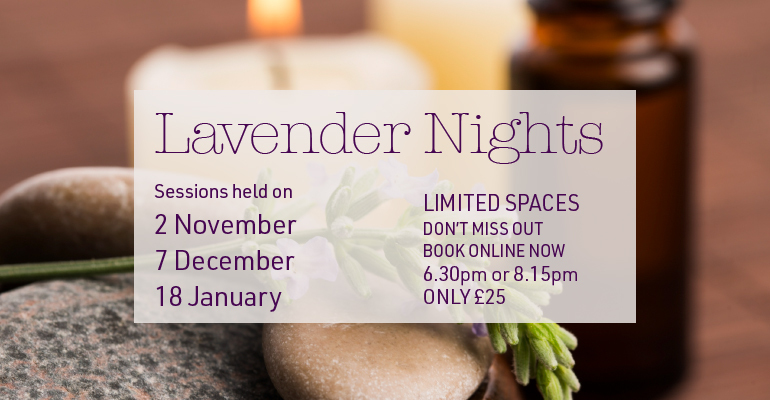 We are now taking bookings for our Autumn Lavender Night sessions, on Friday 2 November, 7 December and 18 January. Learn the art of relaxation. Experience 90 minutes of gentle meditation, therapy, breathing techniques, soothing warm stones and lavender oils accompanied by calm music and subdued candlelight. Then complete the indulgent evening with a mug of hot chocolate, horlicks or herbal tea. These popular evenings are in high demand, limited spaces available. Book now to guarantee your mat for 90 mins of ‘Indulgent Relaxation’ time.